What do you do with Tumeric? Carrot/ginger/tumeric soup! Tumeric is a root that grows in southeast Asia. It looks kind of like ginger (and is actually in the ginger family) but it has brightly colored flesh. I have not seen it in our local Wegmans in root form, but it is easily available in a jar in the spice section — dried and ground into a powder. Well, the bottle just sat there, barely used — until one day, I had the best breakfast one morning at our local vegan restaurant Strong Hearts. Their “scrambled eggs” are actually tofu scrambled with turmeric, onion, and peppers. Really delicious. For a week, I ate scrambled tofu 3 or 4 times! And here it is, that time of our lives where rebooting, rethinking, reworking is what it’s all about. And, since chronic inflammation in the body is the root cause of so many of our aches and pains, I’ve been following the advice of Dr. Weil and adding more anti-inflammatory spices to our diet. We’re all going to grow old, might as well feel as good as you can as long as you are able, right? Anywho, when my DH asked what I used it for, I told him about the fake eggs and the curry and also how good it is for fighting inflammation. He reminded me to pick up more fresh ginger (as we like to drink carrot/ginger juice.) That got me thinking that I should make something with carrot, turmeric and ginger in it. A quick search on the internet of those three ingredients brought me to this incredibly simple, really tasty recipe. From thought to eating it took me about 45 minutes to reach a state of pure satisfaction! Since this was the first time I made it and I had all the ingredients — I decided to keep on the straight and narrow — AND FOLLOW THE RECIPE EXACTLY. (Gasp!) Here it is — you must try it! Does this look amazing or what? I’ve “massaged” my kale (with avocado and salt — yummy!) — I’ve steamed it in chicken broth and dressed it with garlic — but I’ve never seen a salad with raw Brussels sprouts and kale shaved and combined. This I have to try. I’ll bet you could use any dressing that suits your mood. By the way, I always learned that you called these petite cabbages “brussel sprouts” — but according to The Grammarist — it’s actually correct to call them Brussels sprouts. I guess you learn something new every day. Shaved kale & brussel sprouts in a salad! Here’s the original recipe. Can’t wait to try it! I poked around in the fridge for inspiration. Leftovers can always save time when you are hungry! The other night, I diced an eggplant and sautéed it with some garlic, roughly chopped sweet onions, and a can of Muir Glen fire-roasted tomatoes. (They are my favorite!) I served that over pasta — but the kids didn’t seem to enjoy it as much as I did. I had about a cup and a half of that mixture left over and since it had sat for 2 days in the fridge, the flavors had intensified. Over in the pantry was a bag of arborio rice (Italian short grain rice) and a container of chicken broth. 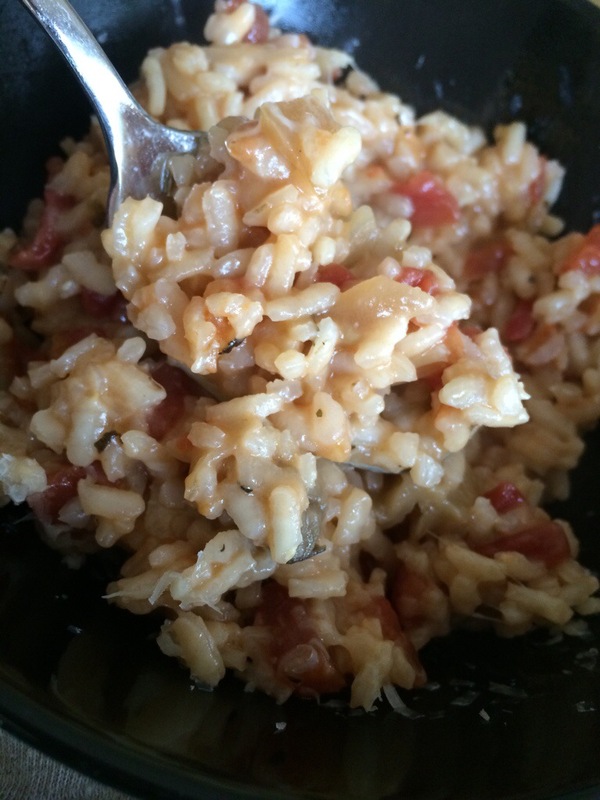 Why not put my leftovers into a risotto? Certainly, people make risotto with eggplant all the time! I took two tablespoons +/- olive oil and poured it into my big skillet set at medium high. After about 5 minutes of “frying’ the rice I added about 1 cup of chicken broth and stirred it while it cooked. I lowered the heat to medium and over the next 20 minutes or so, I continued to add more broth (I used 32oz – 4 cups total) slowly, stirring as the rice absorbed the liquid. What you’re looking for is a creamy consistency — not the dry, white rice that you get in a Chinese restaurant! Keep in mind that risotto is supposed to be cooked “al dente” — which means that it is a little firm and chewy even though it is a very starchy, rice dish. I added my left over eggplant/garlic/onion/tomato mixture right into the pan. Then I shaved parmesan cheese right into the rice, a few pinches of salt, and I stirred it together. All in all, it took about 25 minutes from the time I started until I was ready to eat. Not bad, eh? It was as good as it looks. And I have some left over — tomorrow, I can just add a little broth and zap it in the microwave. Next time I make this, I want to add fresh tomatoes, fresh basil, and fresh mozzarella right at the end.